he Independent rabbinical court headed by Rabbi Daniel Sperber (center) issues its ruling on Sunday annulling her marriage to her former husband. Jerusalem - In a further challenge to Israel’s Chief Rabbinate’s control of marriage and divorce, an independent, ad hoc, Orthodox rabbinical court has freed a woman from a defunct marriage by annulling the union, the third such case it has resolved in the last nine months. The basis for the court’s annulment of the marriage was the principle in Jewish law of a “mistaken transaction,” whereby it can be assumed that someone entering into an agreement who was not provided with the full details of the transaction would not have agreed to the transaction, had they known the full details. The court stated that the woman had not been informed of her husband’s prior violent behavior and other serious problems, and therefore annulled the marriage on the principle in Jewish law of a “mistaken transaction,” whereby it can be assumed that someone entering into agreement who was not provided with the full details of the transaction would not have agreed to it had they known. According to the Center for Women’s Justice, which requested that the court convene on the case, this is the first time in Israel that any rabbinical court has annulled a marriage on the principle of “mistaken transaction” outside of cases where the spouse is missing or comatose. 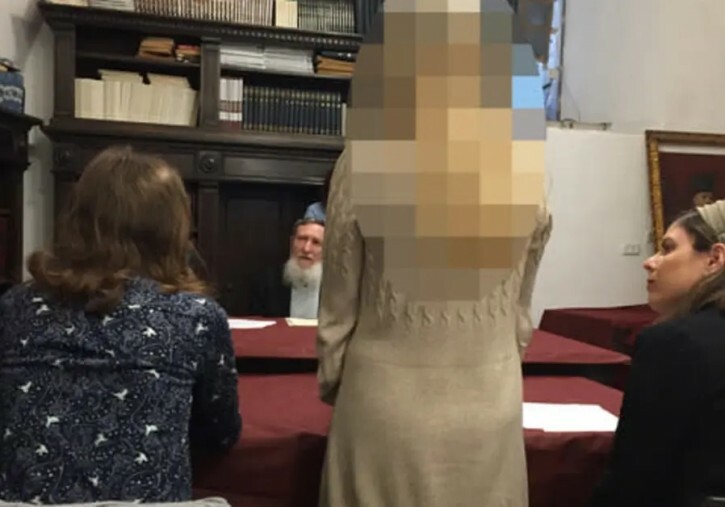 Independent rabbinical court rulings are not seen as valid by the Chief Rabbinate and the state Rabbinical Courts Administration, and the woman in question would likely encounter difficulties re-marrying in Israel through the rabbinate. The court, headed by Rabbi Daniel Sperber and convened by the Center for Women’s Justice, has previously issued two similar rulings, both in 2018, one for a woman denied a divorce for more than 18 years and one for a woman denied a divorce for nine years. The state rabbinic courts have struggled to resolve the most severe and intractable long-term cases of divorce refusal, and have not used tools within Jewish law to dissolve or annul marriages which some Orthodox rabbis have endorsed. According to CWJ, the woman, who cannot be named since her ex-husband poses a physical threat to her, was pressured into the marriage, which quickly became highly problematic. During the marriage, her ex-husband was violent and emotionally abusive, and humiliated her in various ways. He had been married previously, which the woman was aware of, subsequently refused to grant his first wife a divorce, and eventually used the divorce process to extort favorable terms in the divorce agreement, a fact which his second wife was unaware of when she married him. According to CWJ, the man has been released from prison, is no longer part of the Jewish community, lives with a Muslim woman and no longer considers himself Jewish. Since the woman was not told that the man was violently and emotionally abusive toward his first wife, as well as the fact that the woman had been pressured into the marriage, Sperber and two other rabbinical judges, who have declined to disclose their names, annulled the marriage and ruled that the woman is single, that her marriage had never been valid, and that she is free to marry anyone, even a cohen, whom divorcees are generally prohibited from marrying. “The verbal, psychological and physical abuse that she went through justifies without any doubt separating her from her husband, and if the man would have been heard by a rabbinical court there is no doubt that they would have ruled to obligate him to grant a divorce,” wrote the rabbinical judges of the ad hoc court. “The husband is evil and wicked and refuses to grant the long-awaited divorce, he does not listen to teachers and continues to sin towards G-d and his fellow man. It appears that the chance of getting a divorce from him are zero,” they wrote. They also wrote that since the woman was totally unaware of the man’s severe problems before she married him, the marriage was a “clear” example of “mistaken transaction,” and that the marriage should therefore be annulled. The rabbis also said that the fact that the man was living with a Muslim woman meant he was essentially an apostate. Following the ruling, the Center for Women’s Justice saying that it was pleased that the rabbinical court had annulled the marriage and disregarded the husband’s refusal to willingly terminate the union. This is the wrong approach on so many levels. So now everyone who is not happy with their marriage can argue Mekach Ta'os??? (And that she can marry a cohen??) So whats next for this BD? Mercy killings? Allowable Avoda Zarah? We allowed a breach in the first of the 3 (mitzvos that we're to give our life for...) why not continue....??? But she still can't have a state-approved remarriage. If a husband can get a heter to have 2 wives, there must be an appropriate solution for a wife. This is a good step. very sad indeed but it doesn't sound like the type of girl forced into this crazy kind of marriage reads vin nor what hear about these crazy stories. You might reflect a slightly higher level of intellect if you allowed the commenting about halacha to those with such expertise. I am also wary about this psak, but I cannot go beyond being significantly curious about the details relevant to halacha. Careful. You imply that halacha needs to be undermined for your predetermined notion of "equal rights". It is not about male superiority. It is about following halacha implicitly, and adjusting ourselves to complete compliance. wonder what Orthodox rabbi this is ?? If the "din" (law) is that a Kiddushin could be annulled, as we see from the gemorah and reshonim, when the question is asked ask how can the Chachmim go against the direct Torah? They answer - it is not going against the Torah, but since they got married according to the chachmim, by accepting under the chuppah they are are entering into this union "al Daas Moshe v'Yisroel" - which means according to the laws of the Chacumim. After accepting this, the Chacumim retroactively have the power to say, the ring he gave her was not lishem (for) Kiddushin, but simply a gift and it is as if she was never married. That is the gemorah! If you don't like, want to adhere, or accept this gemorah nor the pesak of reshonim. I suggest you find yourself a different religion - I highly recommend the Muslim one, since they also stick their heads in the sand, and only accept what according to "their minds" they want to or deem fit. So now you're an expert on the type of person reading VIN? And you know that that type doesn't get involved with emotionally disturbed and physically violent people? Where exactly were you "educated"? The University of I Know Everything? “ If the "din" (law) is that a Kiddushin could be annulled, as we see from the gemorah and reshonim, when the question is asked ask how can the Chachmim go against the direct Torah? They answer - it is not going against the Torah, but since they got married according to the chachmim, by accepting under the chuppah they are are entering into this union "al Daas Moshe v'Yisroel" - which means according to the laws of the Chacumim. After accepting this, the Chacumim retroactively have the power to say, the ring he gave her was not lishem (for) Kiddushin, but simply a gift and it is as if she was never married. That is the gemorah! The foremost Poskim are not willing to throw that around every time someone is unhappy. Al daas Moshe v'Yisroel doesn't mean you get to annul it if he's not the man of your dreams. If this is ok, how come this was never done before? Aren't there tons of cases of iguna that if the women would have known they would have never gotten married? If girls in yeshivas and seminaries were taught the true meaniing of kiddushin, they probably would be so turned off that they would choose to remain single or secular. There is a reason it's hidden from them. The the man "acquires" her. He is therefore the only one in halacha who can break the bond. Girls' chinuch should be more honest, so you can't blame anyone for choosing to buck that system. I admire the woman in the article. That may all be theoretically true. However, it is well documented that Rabbi Moshe Feinstein was greatly pained by the situation of countless agunot (women "chained" to marriage, absent receiving a religious divorce). Do you think R' Moshe was unaware of that Gemara? Firstly, why do seminaries and girls's yeshivas hide the true meaning of kiddushin and a single-ring ceremony ? Girls should learn the halachic truth about this so-called acqusition process, so they can decide if it's for them. Secondly, it's anyone's choice to decide which rules to follow. The stricter halacha is unfair and you can't blame anyone for bucking the system. You must be trolling. You cant seriously believe that “chachomim” today can declare the ring a gift. I know the reasoning, but nowadays people want more equality. You can't force your religious views on women who want a heter for annulment. You're comment is the "wrong approach on so many levels". -Its based on fear mongering not halacha or a bais din. Let me inform you of a little secret - Reb Moshe Z'L was matter over 3,000 agunot after the war. Others in Israel and Europe did the same. Think of it - weren't they scared maybe the husband is still alive somewhere, and now they are causing mamzerim to be running around. In back of their minds they relied on was this very heter (leniency) that they have the power to annual the kiddushin retroactively. This is the true reason they were all easy on helping the agunot, as there was a "fall back" plan This heter they knew is only to be used in "extreme cases" an what is more demanding then the holocaust. The Rabbis here are only using this heter in an "extreme" agunot cases, that they feel there is no other way she can ever get married again. This is not using it willy-nilly, but only in desperate cases. May Hashem bless these good and holy Rabbonim that are stepping up to the plate in the same form Reb Moshe stepped up when the need was great. You don't want to use this heter, should your young daughter g-d forbid never be able to marry again, that is your prerogative. However those who choose to do so, please don't criticize them - They have solid ground on what to rely on. Rav Moshe annulled a marriage. Torah is Torah it doesn't change. Nobady's discussing changing the Torah. It's about the Israeli government forbidding heter meah rabbonim under all circumstances , if women can't get the same. Annulments can also be a part of the solution. The government has to be based on equality, since not everybody wishes to succumb to halachically approved discrimination. Many people re proud of the courage of this eishes ish. Some of the commentators on this site, live in the dark ages, and should shake hands with the Taliban in Afghanistan and the religious police in Saudi Arabia. If a woman is able (through an Orthodox Court), to free herself from an abusive spouse, who may beat her and her children, or who performs other despicable deeds against her and others, I give her and this Orthodox Court credit. The days where a husband would not grant his wife a get, and she would have to suffer in silence are long gone.Tov M'od!! “ Let me inform you of a little secret - Reb Moshe Z'L was matter over 3,000 agunot after the war. Others in Israel and Europe did the same. Think of it - weren't they scared maybe the husband is still alive somewhere, and now they are causing mamzerim to be running around. In back of their minds they relied on was this very heter (leniency) that they have the power to annual the kiddushin retroactively. This is the true reason they were all easy on helping the agunot, as there was a "fall back" plan This heter they knew is only to be used in "extreme cases" an what is more demanding then the holocaust. You are an incredible moron. He was matir thousands of agunos and never used this alleged heter of the Avi Weiss crew. That should tell you a lot. But your a moron. And probably Sperber is proud to make mamzerim. As are the Avi Weiss crowds. They want more mamzerim like them. The gemara also says, if a man is mekadish a woman on condition that he's a tzadik the kiddushin (transaction) goes through even though he's a rasha. Now, who's responsible that she didn't do her due diligence to find out whom she's marrying? Where in the gemara or halacha does it say that the kedushin only goes through of she knows every detail about him? Force religious views? She can get married or live with someone without marriage and nobody can force upon her anything. We're talking halacha here, and serious halacha when it comes to marital questions. Your am haaratzes is astounding. You have no idea of how heter agunot works. Reb Moshe never once used your made heter. Heter agunot of reb Moshe was about relying 100% that the husband is not alive without requiring the usual credible witnesses. Go learn a bit before you comment. Apparently you don’t fully understand why the kiddushin is ok in that case. Look it up. Israeil government forces religious view by fiercely opposing secular divorces. The world's best kept secret is that a mamzer is only from a Jewish father. If a married woman has a child with a different man who is a goy, that child will be a kosher Jew. and can marry anyone .